Luxury kitchen designs for modern and rustic homes. Get the beautiful kitchen design you’ve always wanted with high-end interior design work and custom cabinetry! At RDGi, kitchen interior design is one of our specialties, and we are honored to bring clients’ dream kitchens to life with one-of-a-kind, luxury kitchen designs. Whether you love the look of contemporary kitchen designs or you prefer a more earthy, rustic feel, we’ve got you covered with the best interior design team in all of Florida, North Carolina, Chicago, and Atlanta. Contact us today to book your free consultation with our kitchen designers! Why Choose Rinehart Design Group? At RDGi, our interior designers believe that everyone should be able to have the luxury kitchen design of their dreams, and we work closely with clients to make that happen. With more than 21 years of experience creating chic, rustic, historic, and modern kitchen designs, we have what it takes to transform your home or business into an extravagant oasis where you can thrive. Schedule your free consultation with us today, or check out our gallery for some kitchen design ideas! When you choose RDGi as your trusted interior designer, we’ll start by discussing your kitchen remodel ideas and what they entail. You may want to create more room with a kitchen addition, complete with a large dining space, a big kitchen island, and plenty of counter space. Or, you might have something simpler in mind, such as custom, handmade kitchen cabinets and a granite countertop to match. Whatever your kitchen makeover looks like, we’re here to make it happen with the very best tools, materials, and imaginations in the interior design industry. Part of what makes RDGi the preferred interior design company in Florida, North Carolina, Chicago, and Atlanta is that we also offer custom cabinetry that is made by hand. 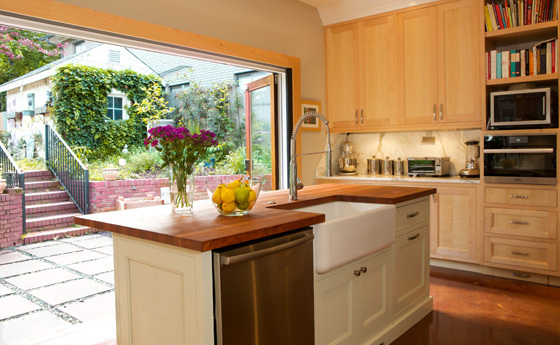 As interior designers, we know the value of custom kitchen cabinets, and we consider them the focal point of any kitchen renovation or remodel. Whether you prefer beautiful cherry, maple, hickory, or a softer wood with a dark stain, our custom cabinet makers are here to complete your luxury kitchen design with one-of-a-kind, handmade cabinets. If you are looking to transform your kitchen into a stunning, personalized space, our interior designers at RDGi are the ones to call. Contact us today to get started with a free consultation!